Cartagena das Indias, Colombia, is one of the most popular tourist destinations in South America because of its beautiful colonial city, the impressive fortifications and Playa Blanca, one of the most stunning Cartagena Colombia beaches. Cartagena das índias should be on top of anyone’s bucket list who wants to see some of South America’s interesting cultural heritage combined with enjoyment on the Caribbean coast. Click, click, clack, clack, click, click, clack, clack, – the typical sound of horseshoes on cobbled narrow streets in the ancient town of Cartagena de Indias reverberated from the front of the colorful old townhouses, like it may have sounded during the last centuries. In the Old Town Cartagena das Indias, Colombia, I feel sent back in time as there are still traces of the medieval architecture when the Spaniards build it in 1533. Even the impressive town wall around the old city is still largely intact. 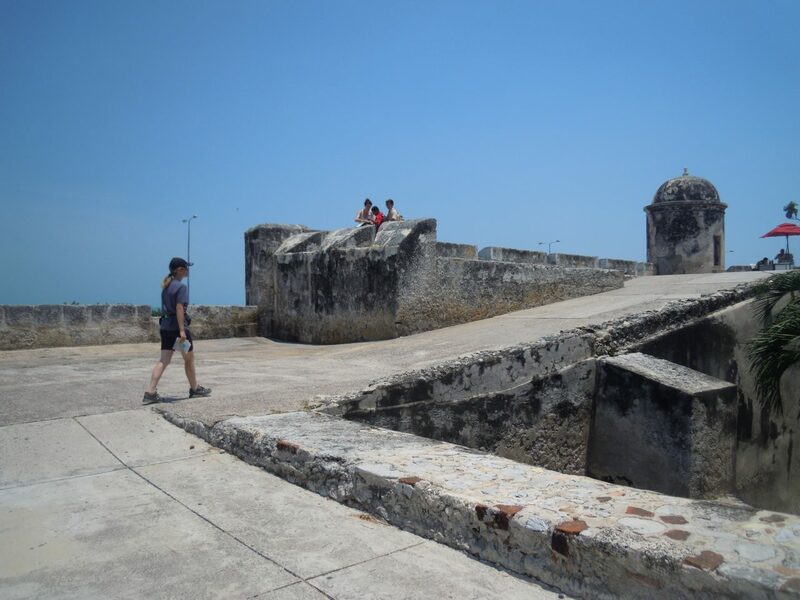 My daughter Naomi and I had decided to tour Cartagena de Indias after our demanding hike to the Lost City. We arrived exhausted but happy in the late evening after a four-hour bus drive from Santa Marta. We checked in to a stunning boutique hotel, which was tucked away on a quiet back road just a five-minute walk from the city park. With only a few guest rooms, the establishment had a cozy, familiar atmosphere. The doorway and the courtyard were tiled with multi-colored Arabic mosaic. A small swimming pool took in most of the patio so that we’d better be sober, as not to fall into the pool after a visit to the tapas bar. It is common for old Spanish colonial manors, that all the living goes inwards, away from the street noise. Same here, where quietness and peace embraced us in the courtyard. 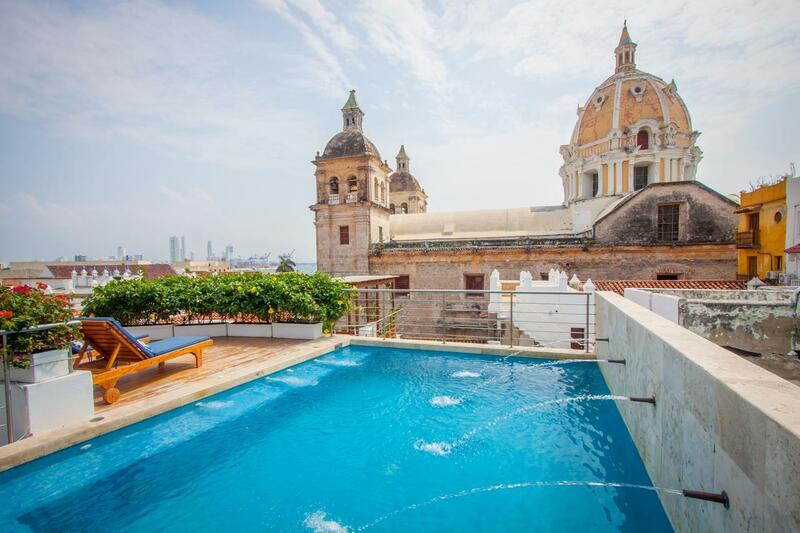 Our picks for an enjoyable stay in the heart of Cartagena das índias. 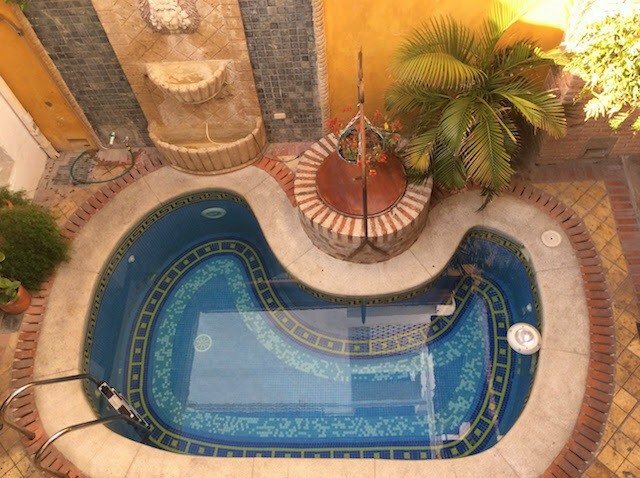 Casa de Alba is in the Old Town with an outdoor swimming pool and a garden. 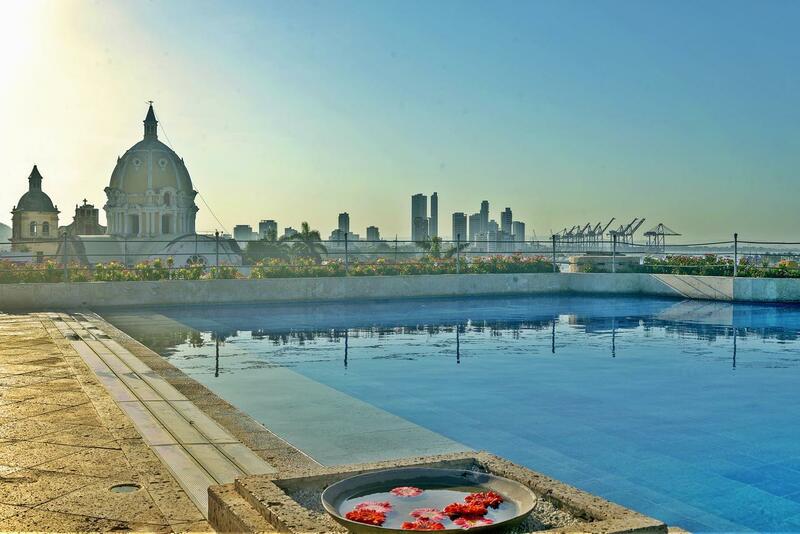 Around 183 m from Bolivar Park, the property is also close to Cartagena’s Gold Museum. 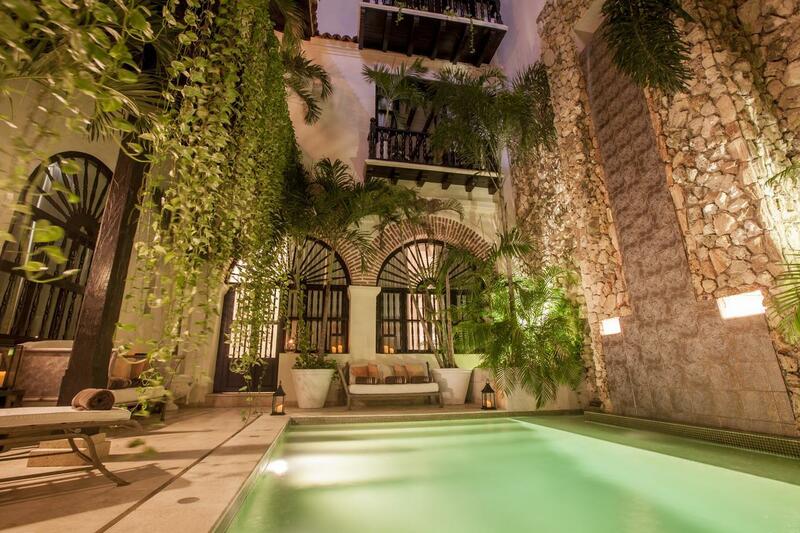 Located in the heart of the bustling historic center of Cartagena and 12 minutes from the beach, Casa Claver Loft Boutique Hotel offers luxurious fully- equipped lofts and rooms in a renovated 17th- century building. Charleston Santa Teresa is a 13-minute walk from the beach with an outdoor swimming pool, a hot tub, luxurious décor, marble floors and stone pillars only two blocks from the sea. 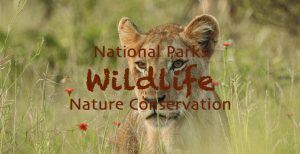 Spa facilities are available. Cartagena das índias, better known only as “Cartagena”, is with 1 million inhabitants the fifth largest city of Colombia. Pedro de Heredia in 1533, founded Cartagena das Indias although indigenous tribes had inhabited the region since 4000 BC. 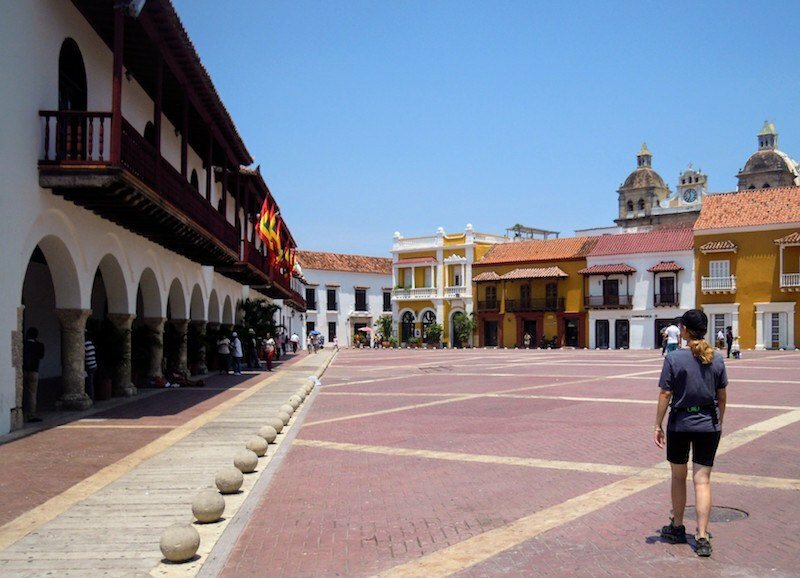 As one of the most important cities of the Spanish crown in America in colonial times, practically all gold and other riches that were exploited by the Spaniards passed through the port of Cartagena, Colombia. Colombian Salsa songs also commemorate the sad past as only place in South America authorized by Spain for the slave trade. Due to its importance and the great number of riches that it housed, Cartagena was the victim of constant attacks of English, Dutch and French pirates. To protect themselves, huge ramparts and a large military complex was erected in the city. Today, most of these buildings are still standing, and for this reason, UNESCO granted Cartagena the title of World Heritage. In the morning we walked a small section on the ancient city wall to see the Caribbean Sea and the modern city on one side and the old city on the other. Along the narrow sidewalks, street vendors offered fruit, shoes and local crafts at their provisory market stands. Most probably this scenery compared not much of a difference to old times. Unlike then, the horses’ coaches are now filled with tourists, trying to hold their cameras steady while the wheels hobble over the cobbled roads. During daytime, the streets are chock blocked with yellow taxis trying to buzz through the tight alleys like a swarm of bees. It crossed my mind how nice it would be if the Old Town of Cartagena das índias was a car-free zone. 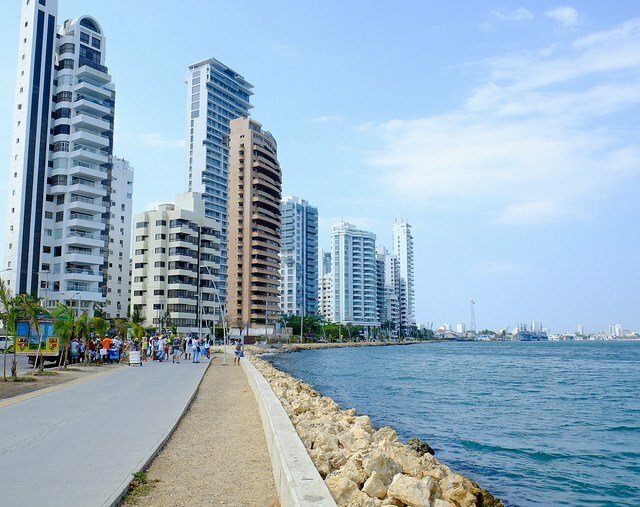 The Port of Cartagena, Colombia, is situated about four kilometers from the Old Town and is one of the most modern ports in South America. 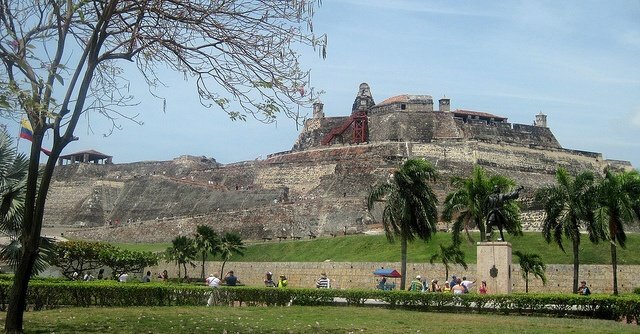 The cruise lines often “sell” Cartagena de Indias as the highlight of a Caribbean cruise. Cruise ships dock at the Maritimo de Cartagena terminal. 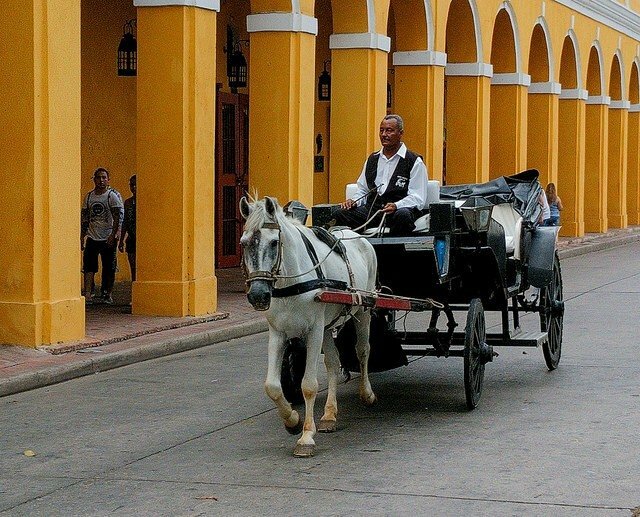 There is a shuttle to the center of Cartagena. 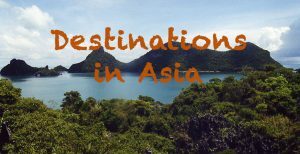 Tipp: From Cartagena, you can tour the most beautiful Rosario Islands with Isla Grande, and Isla Baru. One of the best beaches in Cartagena, Colombia, is Playa Blanca in Baru, only 40 minutes by boat or by land from Cartagena. The turquoise water, white sand deflect from the nuisance of importunate local vendors. 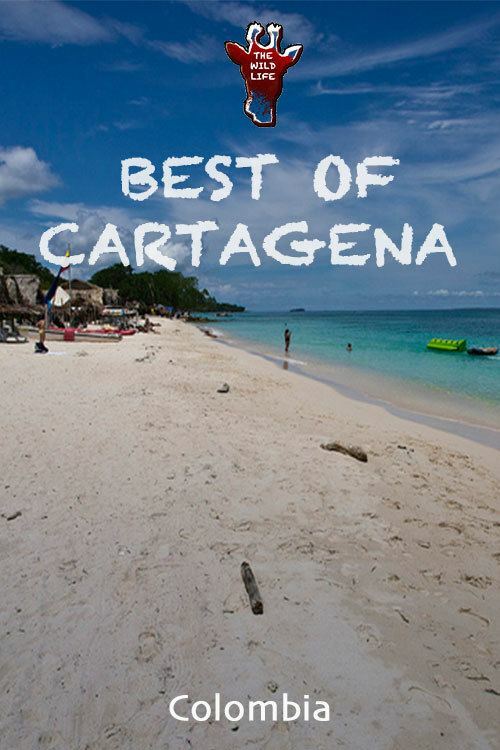 Talking about the best beaches in Cartagena, Colombia, Punta Arena has to be mentioned. Situated on Tierra Bomba island right in front of the beaches of Castillogrande, it’s only a 10 minutes boat trip to this spectacular beach. The more quiet parts of the beach are to the right of where the boat will drop you off. One of the best beaches in Cartagena to watch the sunset is Castillogrande beach. The sea is clean and clear and you’ll find also more quiet spots with fewer vendors towards the naval club. The extensive beaches of La Boquilla Beach invite most of all Colombian nationals to spend their holidays. 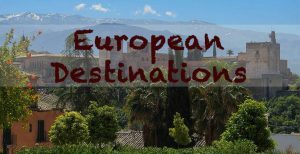 Many restaurants line up along the coast, where also hotel chains start to attract a more international clientele, despite the location is quite far from Cartagena. Manzanillo Del Mar Beach is one of the most solitary and tranquil beaches of Cartagena. 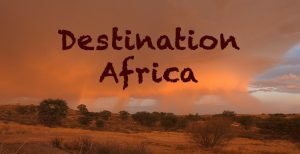 Here you’ll find luxury resorts along the extensive beaches and beyond. 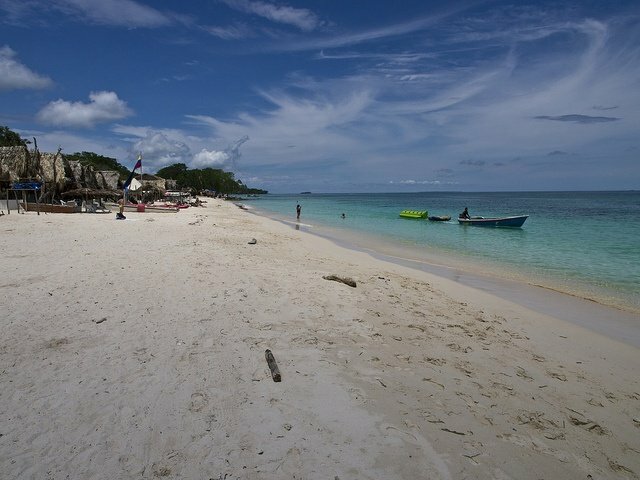 With 35 Minutes drive from the center of Cartagena, its the furthest away from all other beaches above. 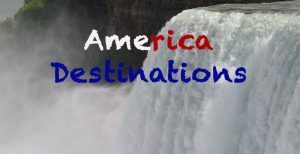 All main attractions are in the center easily walkable by foot. 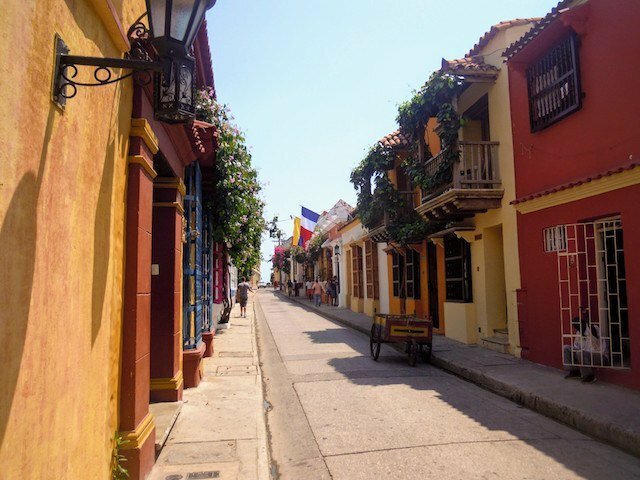 If you stay in one of the beautiful Boutique Hotels in the Old Town of Cartagena de Indias, you can just stumble out of your porch and enjoy the colorful alleys and reach the city walls within a short distance. It’s possible to walk the wall which circulates the city almost in its full extension. The fortification began was completed in 1657 after more than hundred years construction. It is the largest Spanish military work in America and is a testimony of many battles against English, Dutch and French pirates. 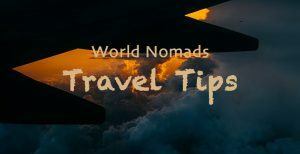 We spent two days in Cartagena de Indias and enjoyed local specialties in abundance, delicious but with a hefty price tag adapted to foreigners. The ancient city wall, the townhouses adorned with colorful flower baskets and the pretty horses’ coaches were most charming and leave an unforgettable memory.